Green Infrastructure (GI) is based on the principle that ‘protecting and enhancing nature and natural processes […] are consciously integrated into spatial planning and territorial development’. 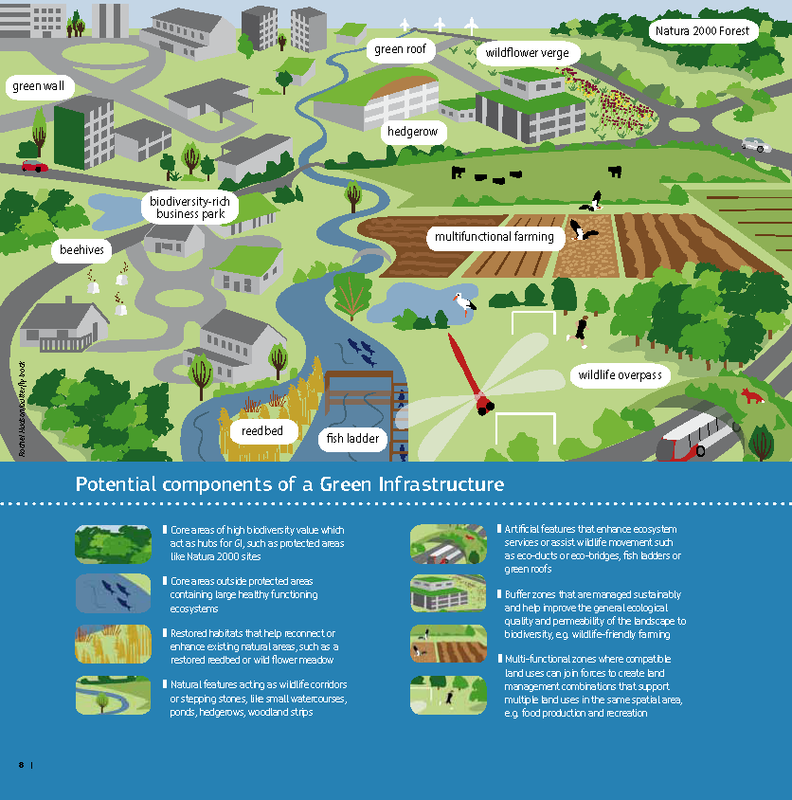 Accordingly, the Green Infrastructure Strategy defines GI as ‘a strategically planned network of natural and semi-natural areas with other environmental features designed and managed to deliver a wide range of ecosystem services’ in both rural and urban settings (EC, 2013a). 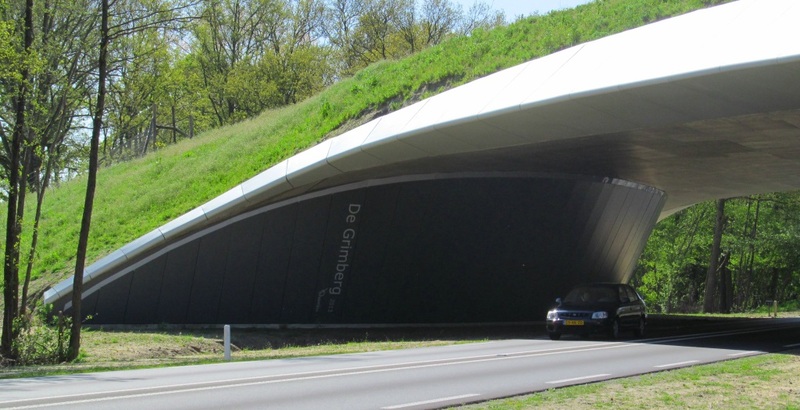 In contrast to the most common ‘grey’ (man-made, constructed) infrastructure approaches that serve one single objective, GI promotes multifunctionality, which means that the same area of land is able to perform several functions and offer multiple benefits if its ecosystems are in a healthy state. More specifically, GI aims to enhance nature's ability to deliver multiple valuable ecosystem goods and services, potentially providing a wide range of environmental, social, climate change adaptation and mitigation, and biodiversity benefits. Moreover, GI favours a more sustainable and resource efficient development process by encouraging the use of Europe’s limited space in a coherent, smart and integrated way. GI comprises a wide range of environmental features that operate at different scales and form part of an interconnected ecological network. At the same time, these features must be multifunctional; they must be more than simply ‘a green space’. For example, a single tree in the middle of a city or an isolated patch of uniform grass are unlikely to be qualified as GI unless they also contribute to key local environmental values. Nevertheless, these spatial features may operate at different scales, from small linear features to entire functional ecosystems, and may contribute to GI in urban, peri-urban and rural areas, and both inside and outside protected areas. It should be highlighted that GI is designed to maintain and enhance the delivery of benefits to human society in the form of food, materials, clean water, clean air, climate regulation, flood prevention, pollination, and recreation among others. These benefits are known as ecosystem services. Direct access to the benefits these services provide is particularly important in urban areas and their fringes, where most people live and where the highest population densities are found. What is European policy on green infrastructure? Green infrastructure offers attractive solutions to environmental, social and economic issues, and as such needs to be fully integrated across different policy domains. Green infrastructure will play a key role in achieving EU policy objectives in a variety of interconnected environmental areas, especially when using nature based solutions to preserve natural capital. This is particularly true for those policies regarding biodiversity conservation, territorial development and cohesion, climate change mitigation and adaptation, agriculture, and forestry management. In addition, the strategy relies on Member States to set ‘priorities to restore and promote the use of green infrastructure’ in order to achieve ecosystem restoration from sub-national to EU level. In May 2013, the Commission launched a Green Infrastructure Strategy, which considers GI to be a successfully tested tool for providing ecological, economic and social benefits through natural solutions. The Strategy details the different contributions of GI to European policies and sets out the main strategic developments: integration into key policy areas, creating and improving the knowledge base, providing financial support and carrying out EU-level GI projects. Similarly, the Resource Efficiency Roadmap (part of the EU2020 Resource Efficiency flagship initiatives) refers to green infrastructure as a means to ensure sufficient and connected green spaces. The optimal use of resources concerns raw materials, energy, water, air, land, soil and leads to a reduction of the impacts from climate change, air pollution, noise, health, accidents, biodiversity and ecosystem degradation. The use of land is nearly always a trade-off between various social, economic and environmental needs (e.g. housing, transport infrastructure, energy production, agriculture, nature protection). Decisions on land use are long term commitments which are difficult or costly to reverse. Therefore, it is necessary to better integrate direct and indirect land use and their environmental impacts in decision making at all levels. Green infrastructure is also considered as a ‘tool for providing ecological, economic and social benefits through natural solutions’ as stated in the Seventh Environment Action Programme of the EU (7th EAP) Moreover, the 7th EAP highlights the increasing loss of urban green areas and, based on specific urban biodiversity data, such as the City Biodiversity Index, recommends the reintroduction of nature into cities. What is the EEA’s contribution to green infrastructure? The EEA has engaged in green infrastructure to support policymakers and the general public. In this context the EEA has approached the topic on different scales, starting from the broad European landscape and zooming in to the city level. In 2011, the Green infrastructure and territorial cohesion report was published, which underlined the importance of developing tools to detect and measure green infrastructure. It also provided input to national and regional priority and target setting and fed into the EU’s Communication on Green Infrastructure. European Environment Agency, 2011. Green infrastructure and territorial cohesion: The concept of green infrastructure and its integration into policies using monitoring systems. Publications Office, Luxembourg. The Spatial analysis of green infrastructure in Europe report evaluates green infrastructure as an ecological and spatial concept for promoting ecosystem health and resilience, contributing to biodiversity conservation and benefiting humans by promoting the delivery of ecosystem services such as climate change mitigation, provision of key habitats to biota, and habitat connectivity. European Environment Agency, 2014. Spatial analysis of green infrastructure in Europe. Publications Office, Luxembourg. More recently, a report called Exploring nature-based solutions - the role of green infrastructure in mitigating the impacts of weather- and climate change-related natural hazards builds on previous reports to demonstrate how green infrastructure contributes to mitigating the adverse effects of extreme weather- and climate-related events. The report focuses on certain types of event that will very likely be amplified by ongoing climate change, i.e. landslides, avalanches, floods and storm surges. In addition, the report also touches upon the green infrastructure and ecosystem services contributing to global climate regulation. European Environment Agency, 2015. Exploring nature-based solutions: The role of green infrastructure in mitigating the impacts of weather- and climate change-related natural hazards. Publications Office, Luxembourg. European Commission, 2013a, Green Infrastructure (GI) — Enhancing Europe’s Natural Capital - COM(2013) 149. European Commission, 2013b, Building a green infrastructure for Europe. Publ. Office of the European Union, Luxembourg. Exploring nature-based solutions — The role of green infrastructure in mitigating the impacts of weather- and climate change-related natural hazards This report focuses on certain types of extreme events and natural hazards at European scale that will be very likely amplified by ongoing climate change, i.e. landslides, avalanches, floods and storm surges. In addition, the report also touches upon the green infrastructure and ecosystem services contributing to global climate regulation. The analysis is carried out using spatially explicit data centred on the physical capacity of ecosystems to deliver services that can mitigate natural hazard risks. Urban green infrastructure Green infrastructure will play a key role in achieving EU policy objectives, especially when using nature based solutions to preserve natural capital. Creating and improving the knowledge base remains one of the strategic developments for the implementation of the EU Strategy on green infrastructure. For references, please go to https://www.eea.europa.eu/themes/sustainability-transitions/urban-environment/urban-green-infrastructure/what-is-green-infrastructure or scan the QR code.